I am a teacher researcher. What that means is that each year, I formulate a research question and go about observing, making field notes, reading the research, interviewing people, analyzing data, drawing conclusions, and going public with my work in my classroom, in my school district, in my community, and/or in my professional community. Over the years, I have posed and studied a number of questions and made a number of useful discoveries. Not only has my teacher research deepened and strengthened my own understanding of teaching and learning, it has allowed me to participate in the ongoing professional conversation with colleagues near and far in professional journals and online publications. Teacher research is the most powerful, most in-depth, most relevant, and most useful Professional Development I know. Without exception, the PD offerings I’ve encountered at my school pale in comparison to the deep and long-lasting improvements to my practice that have come as a result of teacher research. 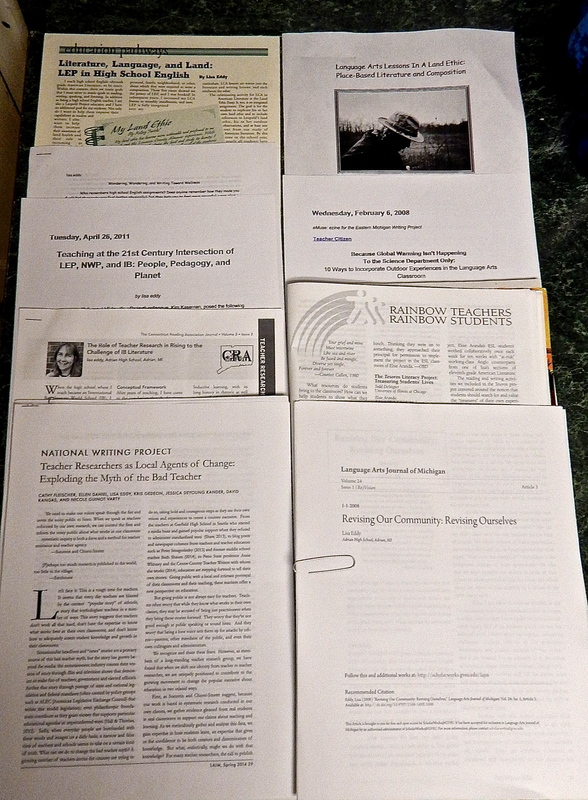 What follows is a brief history of the research questions I have pursued and the publications that came out of my research. 1994-95 What happens when disengaged ELL students and disengaged ELA11 students collaborate on a project? This was a collaboration with with Todd DeStigter, from the University of MI and my ELL colleague, Elsie Aranda. This work resulted in the 1997 publication of the article by Todd, with Elsie and me, “The Tesoros Literacy Project: Treasuring Students’ Lives,” in English Journal. 2002-2003 How can I help Tony achieve his goals? This case study is explored in my 2015 blog post, “Tony’s Triumph: From “Non-Writer” to Published Writer,” published on July 28, 2015. 2004-2005 Does E know that she is a strong and gifted writer? What might it mean when she expresses fear, paranoia, and lack of confidence in her self-assessments? What might it mean that she writes in a male persona? What might motivate her self-deprecating statements? This research culminated in an unpublished case study with an audience of two: the writer who is the subject of the study and myself. We explored the questions I raised through analysis of her work and interviews. It brought me to a more sophisticated and nuanced understanding of one writer’s self-concept and perceptions of herself and her writing. It also helped me to think about how teachers infer ideas from students’ self-assessments, how teachers examine multiple texts to gather information about students, and how these texts may present conflicting information that, if compared, may lead to deeper understanding of students, writers, and the multiple identities we all have as human beings AND writers. 2005-2006 In a college-bound literature course that emphasizes social interaction and outdoor exploration, what literacies, known or hidden, does Vati, a student with Autism, employ in the quest for academic success? How can multimodal literacies guide students toward effective participation in the classroom? This inquiry was motivated by Vati’s arrival in my classroom. His Special Education teacher came to me with concerns about Vati being in the class, and I promised her that I’d do what I could to make his experience in my classroom a good one. I used my research to make changes in my classroom that would help Vati learn and help other students work with him. My research culminated in a case study that I shared with Vati and his parents, but because he was the subject of my research, I cultivated a closer connection with him than I would have, and that, I believe, contributed not only to Vati’s success in the classroom, but to his ability to bond with me and other students in the classroom in a way that had been previously unattainable for him. To this day, I am still in contact with Vati, his parents, and his younger sibling, who took my class at Vati’s insistence. 2005-2006 How do I emphasize play as I teach reading, writing, listening, speaking, viewing, and visually representing? I embarked on this research project in response to an English Journal call for manuscripts, but it became part of my Master’s degree project. 2006-07 What happens when ELA goes outdoors? My research into integrating outdoor experiences, literature, and writing workshop continues, culminating in my final project in my Master’s Degree program at EMU, Written Communication, The Teaching of Writing: Place-Based Play Space: Inquiry Into American Literature and the Local Landscape. It is a year-long, fully integrated, student-centered curriculum that includes literature study, outdoor inquiry, and writing workshop. It includes the theoretical underpinnings of my pedagogy, assignments, scoring rubrics, examples of student work, and the resources that influenced my pedagogical choices and those that informed and inspired the work of the students. 2007-08 What happens when American Literature is taught as place-based critical pedagogy? The publication that is the culmination of this research is from 2008, “Revising Our Community: Revising Ourselves,” in the Language Arts Journal of Michigan. 2008-09 What happens when AHS faculty moves from isolation to collegiality? (A collaboration with Nancy Weatherby, The AHS Writing Initiative) The result of this collaboration was a year-long course of professional development workshops I developed for AHS faculty in Writing Across the Curriculum, Writing to Learn, and Writing on Demand to facilitate the development of authentic writing practices in all AHS courses. 2012-2013 What happens when I teach students to write IB written assessments through genre study? This research culminated in a long paper about using genre study to teach writing and the kind of reading that students must do to be successful on IB assessments. Part of my piece was published in the Connecticut Reading Association Journal “The Role of Teacher Research in Rising to the Challenge of IB Literature,” in Volume 2, Issue 2, 2014. 2013-14 What role does mentoring play in writing instruction? This research culminated in two blog posts, Connecting the Generations: Part 1 and Connecting the Generations: Part 2. 2014-15 What happens when Eastern Michigan Writing Project teacher research colleagues meet in each other’s schools to support one another? Having found such wonderful professional support in our EMWP Teacher-Researcher group, a colleague from the group, Kris Gedeon, and I began EMWP in Lenawee, a collaboration between the two of us to offer professional development and support to one another in our own classrooms between meetings of the full teacher-research group. We are currently collaborating on an article about our experiences to submit for an upcoming issue of the Language Arts Journal of Michigan. Additionally, our teacher researcher group published a collaborative article where we discuss the power of teacher research in our local schools“Teacher Researchers As Local Agents of Change: Exploding the Myth of the Bad Teacher,” Language Arts Journal of Michigan with Cathy Fleischer, Ellen Daniel, Kris Gedeon, Jessica DeYoung Kander, David Kangas, and Nicole Guinot Varty (2014). 2015-16 What happens when Eastern Michigan Writing Project teacher research colleagues meet in each other’s schools to support one another? Kris Gedeon and I found great value in our collaboration, so we’ve decided to continue it a second year, while we continue to think about what makes good PD and what we find so valuable in the NWP model of teacher-to-teacher Professional Development. 2016-17 What happens when I keep asking questions, reading, taking notes, collecting artifacts, interviewing people, reading research, analyzing data, and looking for ways to go public with my discoveries? What questions will I explore? What will I learn? How will it affect my classroom practice? I don’t know what the future will bring, but I know for certain that when August 2016 rolls around, I will be formulating a research question and asking my teacher research colleagues for recommendations of articles, books, and blogs that I should investigate to find out what other thinkers and teachers have said about my topic. Whether I share my discoveries with my students, their parents, the colleagues in my building, or a broader professional audience–my teacher research has been and will continue to be the most powerful and rewarding professional development I could hope for. No one-size-fits-all consultant or program could ever meet MY needs as a teacher or those of MY students the way teacher research does. In my 22 years in the classroom, I’ve seen countless professional development programs and systems come and go, and a precious few offer anything real, lasting, or worthwhile for my practice or my students. Teacher research, on the other hand, grows organically out of the issues and needs that my students have; therefore, it is relevant; it is useful; and it results in deep and lasting changes in my practice. I am a teacher researcher–for life.